Men have an unparalleled place in the home, especially as a husband/father. God presents Himself as a father. Deep seated assumptions concerning the person of God and how He responds to us are influenced by the relationship a child has with his or her father. Sons look to their fathers in figuring out their identity as men. Daughters judge future relationships with men by the standard of their fathers. Wives need their husbands to serve, provide, and protect them in navigating through life. Families as a whole are to be conduits of the gospel, manifesting the relationship between the church and Christ to a lost and forsaken world. Without the men/husband/father in the home, the conduit is broken. Nothing takes the place of a committed father and husband in the home. We know this because God has designed it to be this way (Genesis 1-3; Deuteronomy 6:47; Isaiah 38:19; Psalm 78:5-6; Ephesians 5:22-23, 6:1-8; Colossians 3:18-25; 1 Peter 3:1-7). FBCL recognizes the responsibility and value of the Christian men/husband/father in the home and his leadership in setting the spiritual direction of the family. First Baptist Church Litchfield seeks to train, involve, and equip men/husband/father’s in their divine task of guiding their family. We value ten ways in which men lead their homes: vision, direction, instruction, imitation, inspiration, affirmation, evaluation, correction, provision, and protection. We seek to disciple our men in the faith in order to lead faithfully in the church, community, and home. 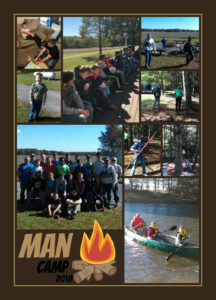 We offer D.N.A Groups, ministry events such as Man Camp and Iron Sharpens Iron, as well as, opportunities to serve. See Pastor Jason for more information in how you can be involved in Men’s Ministry.